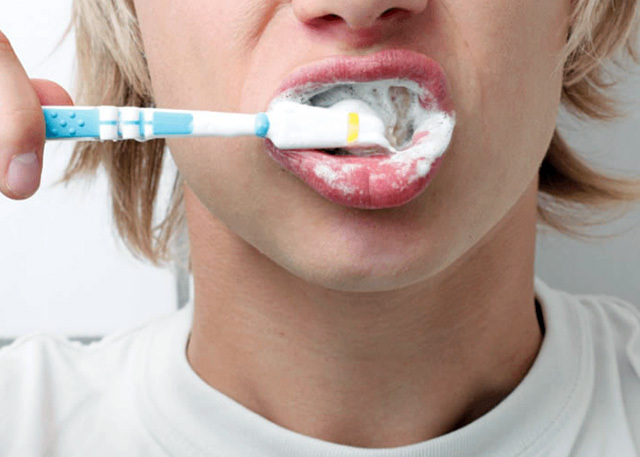 Brushing and toothpaste can't dispel cavity-causing bacteria, despite advertising claims going back more than 100 years. Fluoride, a diet low in sugar and starch, and vitamin D help in cavity prevention, but oral hygiene products without fluoride do not. But this notion is more of an advertising-created myth than fact, according to Philippe Hujoel, a University of Washington School of Dentistry researcher, in an article published in the journal Gerodontology. Almost as far back as a century ago, scientists regarded oral hygiene products as useless in preventing dental cavities. The bacteria causing cavities had been documented to dwell in fissures and cracks on teeth, where they were inaccessible to oral hygiene products. Subsequent clinical research confirms that these scientists had it right. That raises the question: How could dental plaque removal become considered a first line of defense in dental cavity prevention? In his journal article, Hujoel cites direct-to-consumer advertising in the early 20th century, which turned the idea that simple oral hygiene could remove the cavity-causing film into accepted wisdom. The man who globalized this myth to sell toothpaste was marketing pioneer Claude Hopkins. Hopkins also engaged in fearmongering, including claims that grave diseases would be prevented when buying the toothpaste he advertised. Leading scientists, scientific councils, and ethical toothpaste manufacturers did their best to dispel the myths created by such misleading advertising. William Gies, a founder of modern dental education, criticized the scientific ignorance of Hopkins’ advertisements. Scientific councils declared that oral hygiene products were cosmetics. One ethical oral hygiene company’s advertisements described how pseudo-scientific claims created an epidemic of misconceptions. However, none of these efforts prevailed against the power of Hopkins’ mass marketing. On the contrary, advertising directly to health professionals bolstered the perceived effectiveness of oral hygiene products in preventing dental decay, Hujoel wrote in the Gerodontology article. Such advertising is now recognized as effective in increasing sales, and as compromising professional organizations in their public health advice. The later discovery of fluoride as an effective anti-cavity agent further confounded the common wisdom on how to prevent cavities. People often attributed the benefits of fluoride toothpaste to the associated oral hygiene, an idea unsupported by a large body of clinical trial evidence, Hujoel noted. In addition to fluoride’s effectiveness, Hujoel said that what the evidence has actually shown for decades is the importance of vitamin D, which plays a key role in mineralizing and strengthening teeth. Yet vitamin D has now virtually disappeared from the popular discussion of preventing dental decay. If decades of advertising have skewed popular thought on how to prevent cavities, what should consumers do? Hujoel suggests not to look for oral health guidance in advertising. Diet is key. People on very low carbohydrate diets don’t have to worry about cavities, he said, while those who eat significant amounts of sugars and starches should use a toothpaste or oral rinse with fluoride.